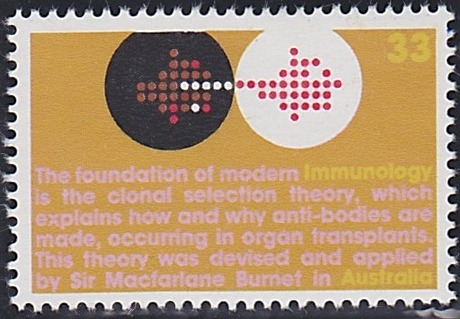 Once again, when turning to a favourite set of stamps, I find myself drawn to an issue from the '70s. I know that words like "vintage" and "retro" are catch-cries of the hipster-generation, and as such are a little over-used at the moment. And lets face it, I mock hipsters, but I myself have, shall we say, "hipster tendencies," (if a pair of ray-bans count as a tendency). Anyhow, I digress. What I am trying to say is that I am more than happy to go with the retro-loving crowd on this one: 1970s design is wicked. New word for the week: SPECTROPHOTOMETRY! So. This classic set of stamps was released in May 1975 and celebrates Australian achievements in science. I don't know if science has ever looked so funky. 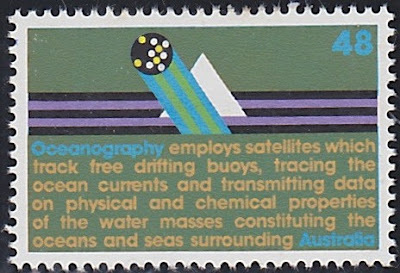 This one makes me think of the movie "The Day After Tomorrow"
The challenge was to convey the significant contributions made by Australia in certain scientific fields. faced with such unfamiliar subject matter, the limited language of graphic design proved inadequate, and it was necessary to resort to written explanations which then became major design elements. These presented their own peculiar problems, since the words had to satisfy the scientists participating in the chosen fields, and at the same time satisfy the rigorous formal demands of space within each design. Well, I think it is safe to say that the designers nailed it. These stamps are brilliant. And I think all the hipsters would agree: Geek is Chic. Hooray for science nerds! 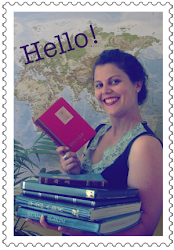 A stamp sized dictionary:-) Clever idea, the oceanography is my favourite. I agree that those designs are brilliant. They are like mini encyclopedias. I like the one with the immunology best. Great designs, very much of their time! You've said it. Brilliant is the world. 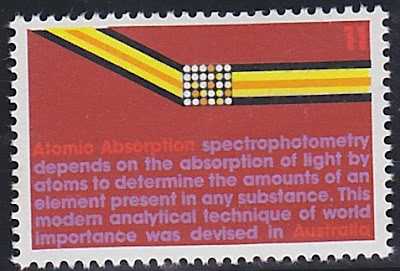 I didn't know the atomic absorotion spectrophotometry was devised in Australia. This is very cool!Stamps with each definition. I love it! I agree with Violetsky - delightful little wikistamps! 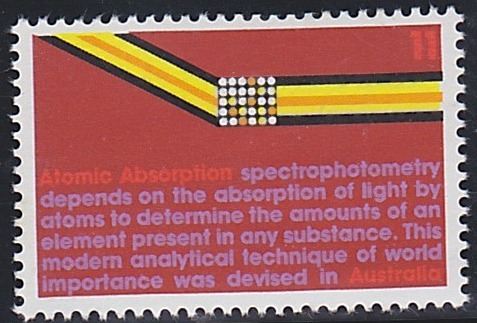 I am familiar with Atomic Absorption - did not know it came from Australia! 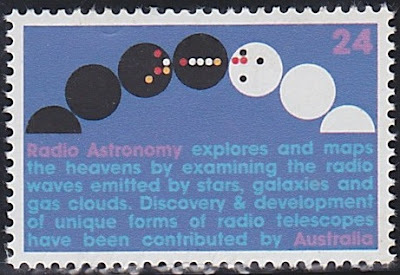 thank you for sharing this brilliant set of stamps.